Recent developments have brought higher education and especially university education back to the fore. The realization that no county can develop without investment in higher education has increased focus on the expectations against a backdrop of historical funding and quality challenges. The resurgence of focus for higher education has manifested in the change in the funding and continued engagement between the higher education sector and other national development initiatives. Several key thrusts stand out to support this argument. Development partners notably, bilateral, multilateral and the American Foundations have contributed to the changed agenda for revamping of the higher education sector in Africa. While the initial support targeted individual universities, a new model that has traction has emerged. The support has propped up partnerships and networks that create synergy for the African University. Agencies such as the RUFORUM, the AAU and Council for the Development of Social Science Research in Africa are good examples. These regional bodies have not only acted as sub agencies to offer small research grants, that have made significant impact on research capacities and output from the university, but have also strengthened the link between the university and the communities. They have further defined the role of the university and its interface with the national development agendas as well as the regional aspirations of the Africa We Want that is espoused by Agenda 2063 and the Sustainable Development Goals. The typology of partnerships and regional networks to support higher education in Africa has manifested at different levels. From the Partnership for Higher Education in Africa [PHEA], that was a commitment from American Foundations to develop higher education in Africa, to the Sida/Sweden collaborative research programme that promoted internationalization and networks between African Universities and Universities in Sweden. Similar networks exist under Norwegian government [NORAD] and Netherlands [NUFFIC] support to Universities. These have played a key role in research capacity and staff development at the graduate, masters, doctoral and post-doctoral levels. There was however, limited interaction among African Universities with a few exceptions around specific academic programmes. Scholars such as Manuel Castells recognizing the dearth of higher education networks in Africa have noted that African universities have to get together in order to get the critical mass that will enable the continent get its bearing and anchor in the knowledge economy that is driving the social and economic development at the global level. The growth on the RUFORUM network from five (5) countries and ten (10) universities to thirty five (35) countries and eighty five (85) member universities within a limited number of years demonstrates impact and synergy that can be harnessed from collaboration. Unlike other bodies that have a legal and national institutional frameworks, the RUFORUM network evolved from the realisation that higher education science and technology have a critical role in the success and development of the agricultural sector in Africa. The success of several of the member universities is derived from collective learning and tapping into the capacities of the potential in the region. The network provides technical capacity and potential talent and a broadened catchment area in the form of students enrolling of the academic and research programmes mounted. It further provides the basis for advancement and for institutions to play a bigger role in the development process. For example, the Plant breeding centre in Makerere University initially supported as a regional programme under RUFORUM has transitioned into an African Centre of Excellence for Crop Improvement MACRRI supported by the World Bank. Similar Centres nurtured under the RUFORUM network were established in Ethiopia, Tanzania, Malawi and Kenya. This is the proof of concept for the value of regional networks for sustainable capacity development. Where previous studies found limited coordination between government departments and projects in universities (Pilly, 2010), the emergence of regional networks have moved beyond individual benefit that has hitherto defined the academe to institutional and collective appreciation. The RUFROUM network has promoted group learning, peer support and the creation of a critical mass of Universities in Africa that have developed capacity to advocate for support to national governments and an acknowledgement of the role of the University in the African Development Agenda. The focus on Agriculture which contributes to close to 30% of the GDP of several African Countries and employs close to 70% of the population has an added advantage. Advocating for a strong agrifood system as a crucial component of Africa’s future development. The RUFORUM visioning process highlighted the urgency of the need to bring all stakeholders on the table to explore and discuss not only how the Universities interface with their peers at national and regional levels but also the need to identify areas of both convergence and divergence in anchoring the university as an engine of development. The process underscored the importance of ownership of initiatives defining the higher education sector in Africa. Vice Chancellors, other administrators, academic staff, development partners, policy makers from governments, and regional agricultural and higher education agencies came together to identify areas of focus and mechanisms of engagement. That economic regional blocks such as the South African Development Cooperation (SADC), the East African Community (EAC) and the Association and African Universities (AAU) converge to chart a way forward for higher education in Africa underscored the convening power of RUFORUM. It highlights increased attention and the potential capacity for professional and academic networks to drive the higher education, agriculture, science and technology agenda. The change has not been limited to the university system only but to the funding agencies themselves. These have transitioned from financial and technical assistance development to creating synergy for collaboration, idea generation and galvanising universities to advocate for financial and policy reforms from national governments and other regional bodies and agencies. The World Bank, the Mastercard Foundation and the Bill and Melinda Gates Foundation have been keen to support the creation of networks beyond the traditional discipline specific associations. These have extended to relationships among universities, with research institutes, communities and policy makers. With sustained engagements for ownership and support of the initiatives, a new era on how universities interface with donors and national and regional bodies has emerged. There is however, a glaring need to sustain momentum. Innovations in institutional governance, association and collective bargaining need to be harnessed for continued advancement. Dr Florence Nakayiwa is the Director of the Planning and Development Department http://pdd.mak.ac.ug at Makerere University. This portfolio includes formulation strategic plans and the integration of the planning and budgeting process of the University. 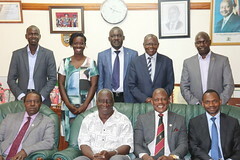 Florence provides the liaison between Makerere University and the Government Ministries of Finance Planning and Economic Development and the Ministry of Education and Sports. She is the Programme Coordinator of Several Development Partner Programmes at Makerere University. These among others include the Makerere University MasterCard Foundation Scholars Programme and the African Development Bank- Higher Education Science and Technology Programme. She is a Board member of the African Higher Education Advancement – AHEAD Initiative, A Board Member of the Makerere University Walter Reed Programme and an Associate Fellow of the Centre for Higher Education Transformation. Florence has a Doctor of Business Administration in Higher Education Management from the University of Bath, United Kingdom and a Masters’ Degree in Economic Policy Management from Makerere University.